M. Night "Indiana Jones" Shyamalan on the case. M. Night Shyamalan’s newest film, “Glass”, hit theaters Friday. It’s the culmination of what Shyamalan has called 20 years of work and planning, and also the final installment in the expanded universe that includes his previous films “Unbreakable” and “Split”. What’s that massive, super-cute robot being installed in Northern Liberties? If you’re a huge Shyamalan fan, odds are good I don’t need to tell you to go see it. And even if you just love Philadelphia, there are plenty of reasons to go check out the Pennsylvania filmmakers’s newest work. 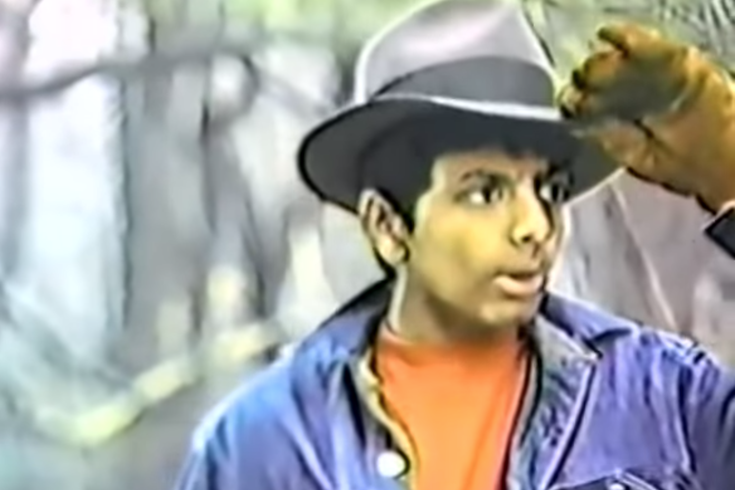 But before you head to the theaters, check out this old Shyamalan home video, shot presumably in some woods near his parents’ Penn Valley home. The home video was a special bonus feature on the DVD for his 2004 film “The Village”, the Washington Post pointed out in 2005, and it’s obviously quite a treat. Plenty of filmmakers and artists have “early work,” and it’s clear in this clip that Shyamalan’s talent was there from a young age. And depending on how you feel about “Glass” — the reviews so far are a mixed bag — you might end up returning here for three minutes of glory.